Amangani Resort is not available for online booking. Please submit an inquiry or call our agents to get pricing and availability information. 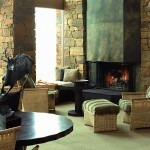 There are 29 suites offered at Amangani. 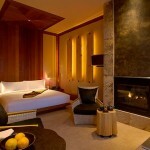 All suites include a bedroom/living room and a spacious bathroom/dressing room. The living areas consist of a king size bed, fireplace, window side daybed, dining table, and lounge area with table and chairs. These suites also offer a minibar, CD player, TV, DVD player, telephone and high speed internet as well as wireless internet access. 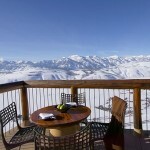 Decks include sliding glass doors, table, chairs and beautiful mountain and valley views. Deep soaking tubs with large bathroom/ dressing area, twin vanities and shower room. Double dressing areas include mirror, shelves, drawers and open closet space for two. Deluxe Suites- Deluxe suites are a little bigger and have large balconies with mountain views. Shoshone Suite- The Shoshone Suite is the same size as the Deluxe Suite but with a large balcony over looking the Snake River Valley and the Teton Mountain Range. 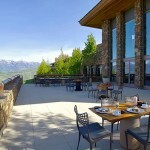 Amangani Suites- The Amangani Suites offer a balcony or patio overlooking the Snake River Valley and Teton Mountain Range. This suite is about 675 sq. ft. and has a spacious bathing and dressing area to create a more open feel. Sena Suite- This suite is located on the ground floor and therefore has a private patio and is about 780 sq. 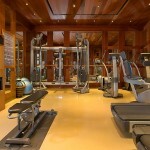 ft. to make it one of the largest suites. 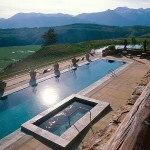 It also has great views of the Grand Teton Mountain Range. 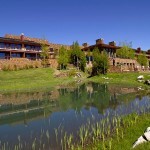 Spring Gulch Suite- This suite is about 675 sq. ft. and is located on the top level giving it a great view of the pool and Grand Teton Mountain Range from its large balcony. 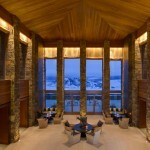 Grand Teton Suite- This suite is about 625 sq. 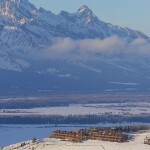 ft. and is located on the top level giving it a great view of the Grand Teton Mountain Ranges as well as surrounding Mountain Ranges. This suite has separate dressing room with the bathroom including a sunken tub and a separate shower. The Grill open for breakfast, lunch and dinner seats 65. They specialize in local ranch meats, fresh fish and seasonal farm to table produce. 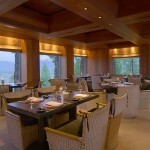 Aside from the restaurant dining guests can also enjoy our private dining room as well as in suite dining. With advanced notice picnic lunches can also be prepared.